Pigeon Forge, TN will bring out the kid in everyone. As you enter you feel like you have just entered the largest carnival you have ever seen and the rush of what to do next seems never ending! Dollywood and Dolly’s Splash Country are the major theme parks and host millions of visitors each year. Along the parkway there are go-karts, mini golf and the temptation of homemade fudge seems to draw you around every corner. There are theaters, comedy shows and museums, such as the Titanic, that provide an endless array of entertainment options. Pigeon Forge offers a variety of activities for the whole family allowing visitors a chance to truly get away and reconnect. Built by Fredrick Emert for Dr. William Harrison Trotter, one of the first examples of Greek Revival style in this area. 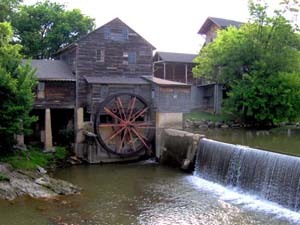 Produced mills, flours and provided electricity until 1935 for Pigeon Forge. It is still on operation and tours are available.